The following pages document a self-organised, self-contained bicycle tour through the Brazilian Amazon region. Only two roads cross this huge area: one from Boa Vista in the far north of Brazil via Manaus and Porto Velho to Cuiaba, the entrance gate to the Pantanal swamps. 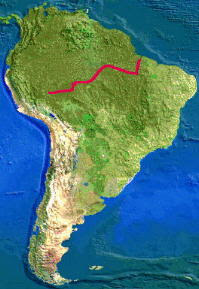 The other one, known as the Transamazônica, runs east-west from the Atlantic Ocean to the Brazilian state of Acre, at the Bolivian and Peruvian border. This bicycle tour along the Transamazon highway was performed in October and November 1999, covering approximately 3.000 km from the Atlantic Ocean at Belém through Pará, Amazonas, Rondônia and Acre to Rio Branco at the Bolivian/Peruvian border. When preparing this trip, little information was found on the Web or in books. This page might help others in planning a trip through this beautiful part of the world.